Niu Noodle House in the West Village is a very good spot to fulfill the craving of a hearty bowl of Chinese-style noodles with an assortment of good dim sum during the dinner hours. Their menu is broad in terms of type of Chinese food it serves (they do serve satays, steam buns, etc. 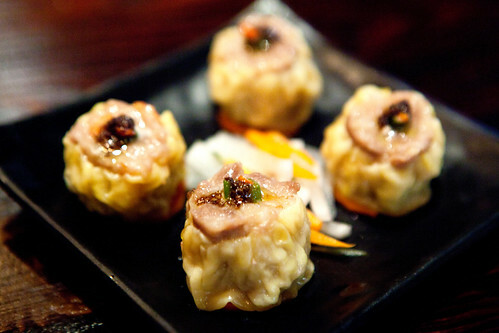 ), affordable (most noodle dishes hover around $14) and nicely portioned. 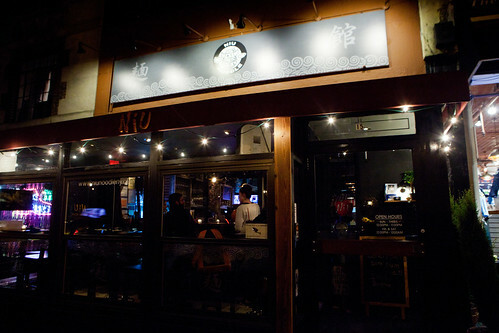 The atmosphere is kind of unusual for a noodle house. It’s definitely not a stereotypical Chinese restaurant. 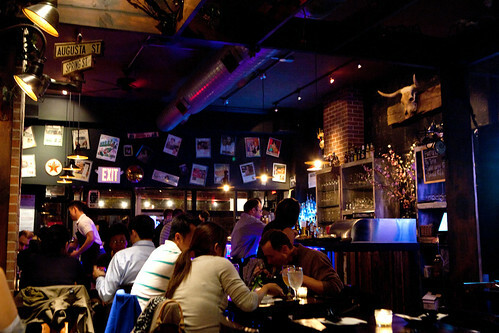 There’s lots of dark wood, artwork on the walls make it look like vintage Americana and touches of taxidermy at the bar area. Service was brisk yet friendly. 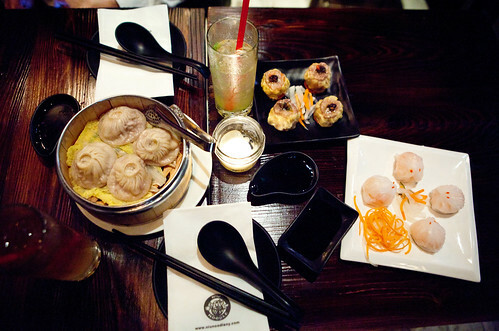 The appetizers we craved were mostly of the dim sum style. Truffled shu mai ($7) that was balanced between the sweet pork and musky truffle. 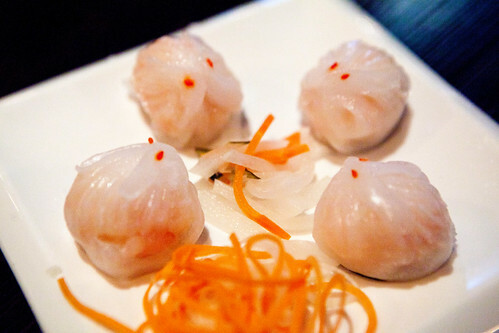 “White jade bunny” shrimp dumplings ($7) were cute little har gao that were slightly crisp from the fresh shrimp and watercress mixed within. 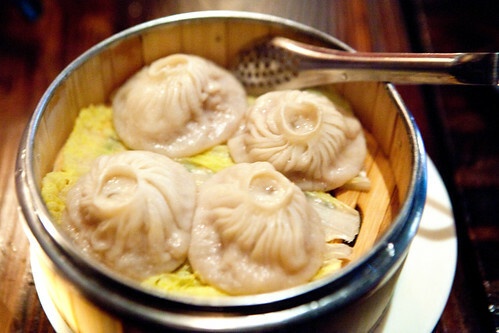 The crabmeat and pork soup dumplings ($6) (or xiao long bao) were piping hot, tasty, and juicy. All of these dumplings came out fresh from the steamer and each dumplings’ skin were thin yet thick enough to stand up to the filling. We did have cocktails ($10 each) of a decently made Dark & Stormy and a refreshing, citrus-y, vodka based Peach Bramble. The main focus of this restaurant is noodles. 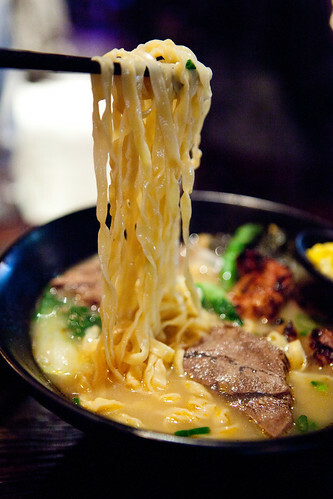 Soup noodles should never dissolve when it’s bitten and has a subtle springiness – and their noodles are great and it’s made in-house, everyday. 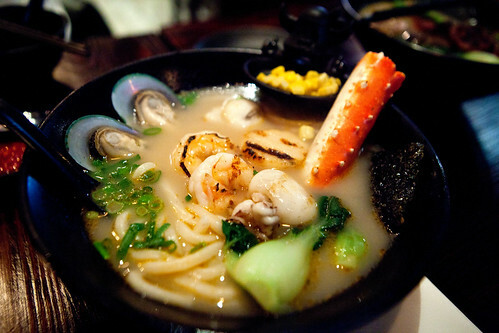 Our large bowl of delicious Ocean Medley ($23) has thick, tender la mein (拉麵) generously topped with a long Alaskan king crab leg, large seared diver scallops, New Zealand mussels, jumbo shrimp, squid, vegetables, bok choy, sweet corn, and a sheet tempura seaweed. 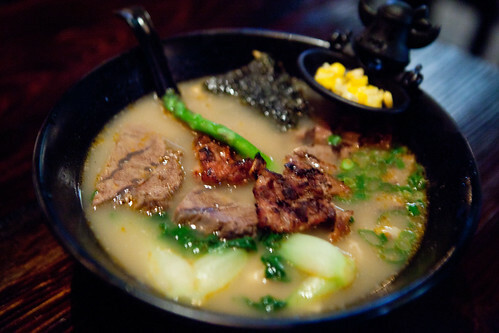 In terms of the soup’s broth, it’s medium-bodied that it’s not slick and heavy with fats or animal proteins. Their more popular Niu beef trifecta ($14) consisting of flank steak, short ribs and beef steak, with large eggy ribbons of noodles, topped with scallion, a halved hard boiled egg, bok choy and a few spears of asparagus was great as well. I really loved the springy noodles that evoked my childhood memories eating a humble bowl of noodles laced with pork and bok choy. The trio cuts of beef added delicious variations of textures and flavors to the sum of the bowl (of course, this was better than what I ate as a kid). 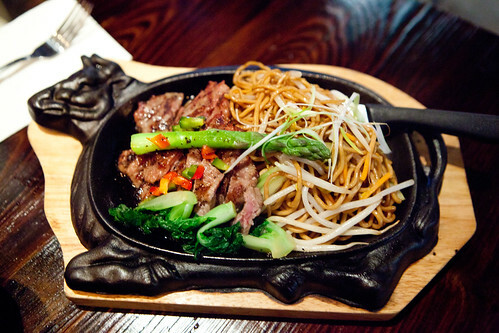 Just to compare, we had their specialty of sizzling black pepper flank steak noodles ($14) that’s set on a sizzling hot cast iron pan shaped like a cow and mixed with diced bell peppers, bean sprouts, and bok choy. The egg noodles used here were round tubular shaped than wide and flat from the beef trifecta and it’s still has great texture. The flavors of this dish were great. It’s not greasy, and it does make think of home. 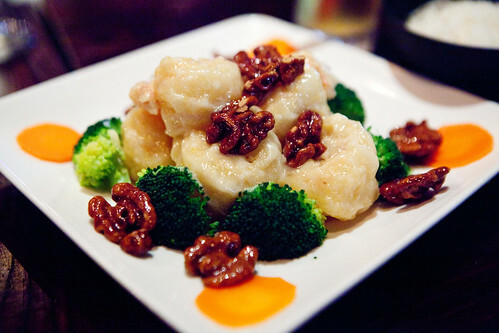 Their wonderful platter of honey walnut shrimp ($23) is what I remembered eating when I was growing up, when my family used to eat out at Chinese banquet-style restaurants. The major difference here is that the fresh shrimp used at Niu is huge or what my dining companion said, “it’s shrimp on steroids.” The stir fried shrimp was tossed in a slightly sweetened, lightly coated in a mayonnaise based sauce then sprinkled with honeyed walnuts to add some crunchy texture and a lovely nutty flavor. In vague ways, the food served at Niu Noodle House reminds me of the food I was raised with but done a bit better, especially the expertly made Chinese-style noodles and better quality ingredients. This place is affordable (none of the dishes are over $23). I wouldn’t mind stopping in here for a good bowl of noodles on a weeknight solo or sharing a casual meal with a small group of friends over their dim sum dishes along with bowls of noodles.